This is my direct drive PT54 flashlight which I finally got to building after having the led sit around for quite a while and I have to say, its a BEAST! Although the PT 54 is pretty old now compared to the quickly advancing Cree LED's it still pumps out the lumens, only problem is heat... the only thing that excels the light output of this is its heat output. If I were to leave this on for 2 mins, the whole light would be at boiling point :eg:. The stock pill on the C6 would never fit the PT 54 so some modifications had to be done, I filed down the pill until it was completely flat and then used a sanded copper coin in attempt to get some better thermal characteristics and rise the led to the reflector, silicon thermal glue was used to bond the coin to the led and the coin to the pill. I also had to cut some grooves in the side of the pill to allow the wires to come out. Yeah its a trustfire, yeah its from DX. BUT they are close to their claimed capacity and I have a lucky cell that can put out 5a in this light with no explosions. 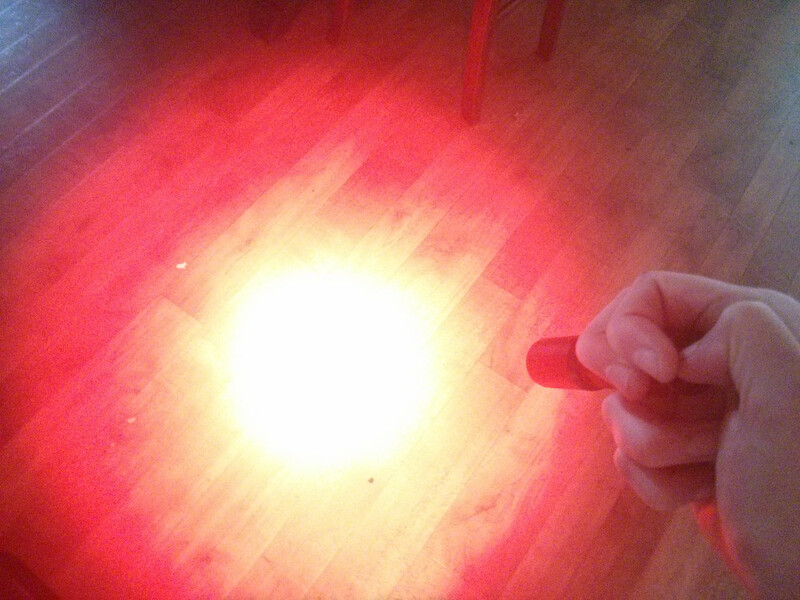 The other light in this^ pic is an x8 from DX which draws 3a from the tailcap and has and xml t6 emitter, which would put out about 800 to 900 lumens, it also has a massive reflector so the light is more concentrated compared to the red. If I had to guess the light output I would say around 700 lumens, that's just me though, and I may be more sensitive to red light than others (at least I think so). That's daring. 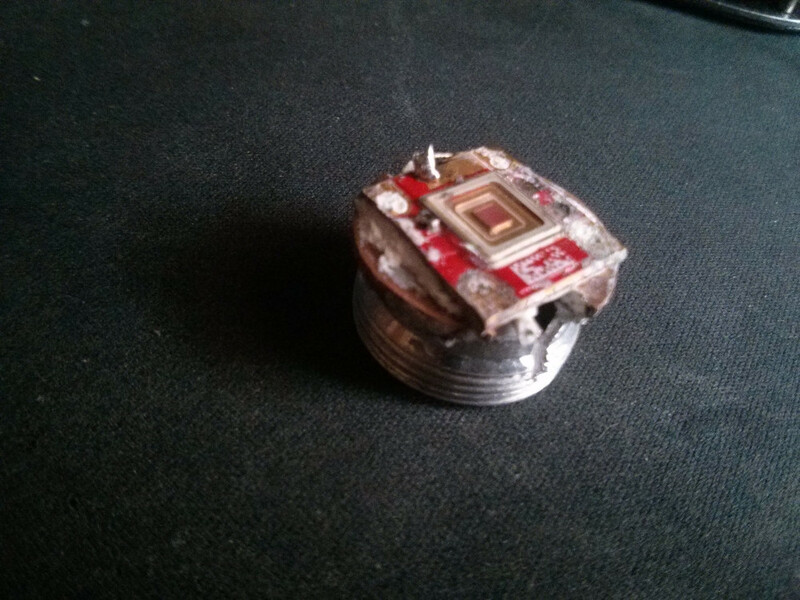 I know they run hot even in their projector environment, but if you could have sinked it better and used larger wire/regulate the current you could have more power longer run times. I understand however you just put a 350 in a pinto and that's pretty cool too. I'm very tempted to make one of these with mine as I have the LED and the host. Anyone know why android phones won't allow you to REP? Very frustrating. My Galaxy S3 wouldn't and my new note 4 wont either. I'm very tempted to make one of theseveral with mine as I have the LED and the host. Really? Will have to try it. Just don't understand why I would have to do it. Irritating. Anyways, I was thinking about doing the same thing but how do you gt away with not burning out the clicky since I think they are only rated for 1.5A plus I would think a much better match would be a panasonic pd cell. Would make me nervous pushing that cell that hard. I'm NOT trying to criticize what you did, but my understanding is that LED can draw 8 amps. Nice build. I did basically the same thing with a C8 host, I think it was running at very roughly 5A. Yes, that is a lot of current for the switch, how do I know I think I lift mine on for something like 2min once and then after that sometimes when I would turn it "off" it would stay on and I would have to click it twice to get it off, turns out the spring in the switch melted through the plastic. 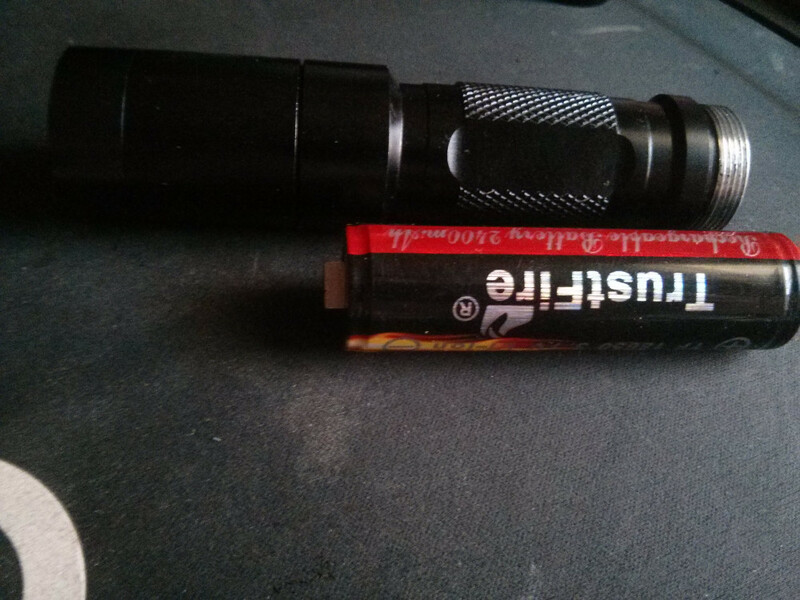 In brightness, I would say it is comparable to my C8 XML-L2 T6 (2.8A to LED) Flashlight, Approximately 800Lm I guess. The PT 54, C8 flashlight's throw is actually better than my XML-L2 C8. I've been getting a fair bit of flicker while its on which does not occur when the switch is bypassed with a bit of wire, also on the spring I added some copper wire to lower the resistance. 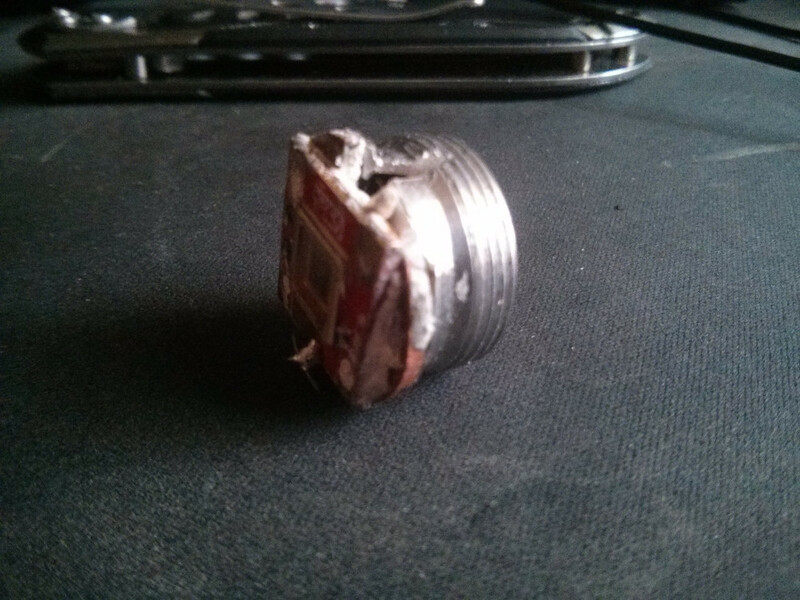 I'm currently building an external momentary switch so I can use it as a monster break light on my bicycle :eg: (I'm not actually that evil) could be a good gun light too. A decent cell would be much MUCH better in a build like this, that way you wouldn't have to worry about the batt venting and turning the light into a rocket or worse. If I had another LED I would use bigger host like a C8 because in a C6 its a very momentary light, and the extra throw would be really nice for a fun build like this. 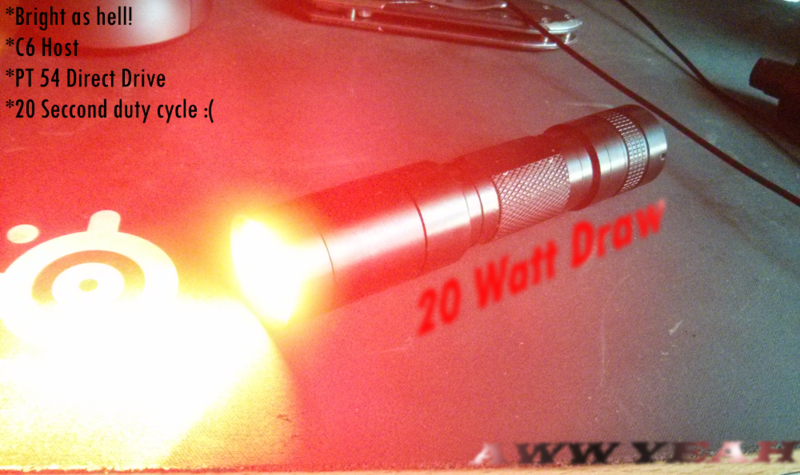 I'm currently building an external momentary switch so I can use it as a monster break light on my bicycle :eg: (I'm not actually that evil) could be a good gun light too. Yeah just realized its actually a bad idea, just seems cool to have an insane brake light. Could point it at the ground to make an under glow effect which would look pretty nice too. A friend of mine wants to put one in his tail section on a snowmobile. He thinks it will look cool when he shoots snow threw the light spinning the track at night. Me on the other hand have a plan (if I ever get around to it) is putting the blue PT-54 I have into the "3rd eye" on my (of course blue) Yamaha R6. P.S. 3pig I've been wanting to ask "what's does the army guy with a laser and bags of Doritos and bottles of Mountain Dew" mean in your signature? That would look really cool, maybe with some angel eyes as well . The R1's and R6's are already some of the meanest looking bikes out there so you won't need much to stand out. I made my sig based off the style of "montage parodies" which is kinda hard to explain. Basically it's purely satirical, and the dude is Ainsley Harriott, a tv chef who has made his way around the internet thanks to reddit and stuff. Its pretty much the result of having too much time on my hands and an immature sense of humor. I saw this and it reminded me of your sig and the post I'm quoting.